6568 41st Court East, Sarasota, Florida 34243, or email him using the link below his photo. 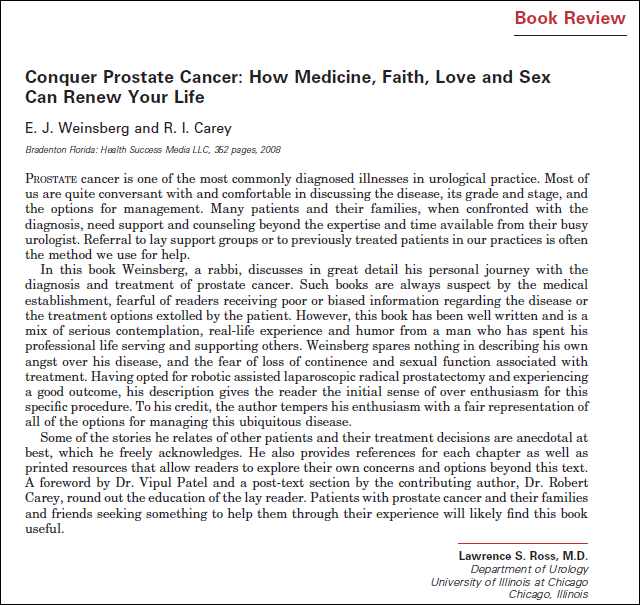 Below are links to media materials for Rabbi Ed Weinsberg and his multiple award-winning book, Conquer Prostate Cancer. News Release: Does Prostate Cancer Screening Save Lives? Rabbi Ed is a member of the American Association of Sexuality Educators, Counselors and Therapists and The International Association of Writers, Speakers and Experts. Rabbi Ed Weinsberg and Dr. Robert Carey at Florida Publishers Association awards banquet, where Conquer Prostate Cancer won a gold medal for excellence in nonfiction.